Last evening I was trying to complete the cover for the new prototype journal I will be using when I start teaching Art Journaling in September. I know these are not the best pictures to post because there is a honking button closure that did not want to co-operate when placed in the scanner. Pooh! I wanted to share it with you anyways and add better pictures later if possible. Arches cold pressed water-colour paper was the paper that I used to make the journal and I assembled it, and bound it. 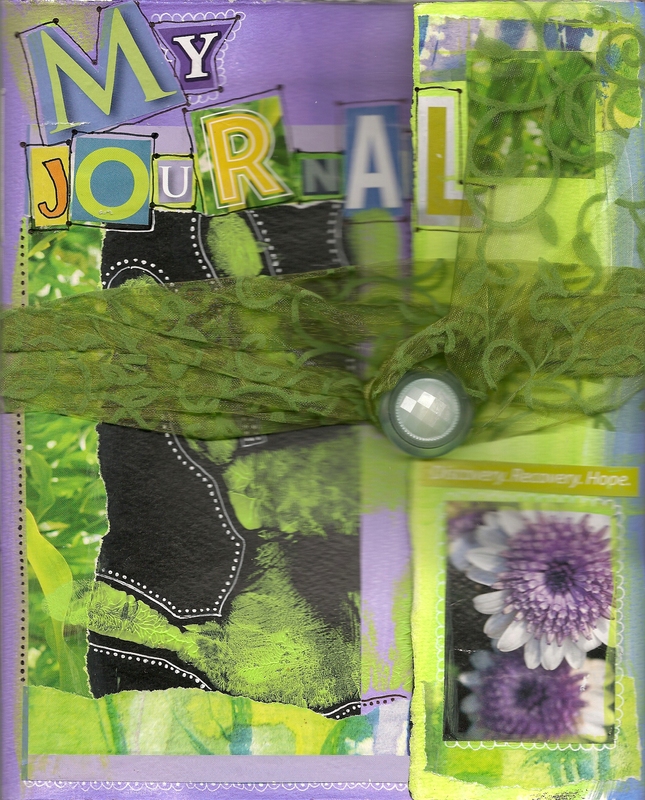 It is a 14 page journal in the style of Teesha Moore. The closure is a tulle flocked ribbon that I bought from the dollar store, wrapped in the style of the remains of the day journals by Mary Ann Moss. It wraps around twice and then twice around the button to hold the journal closed. I used ransom note style lettering and that is my hand print on the top (no copying my fingerprints to use in your next art heist LOL). The hand print is there to represent that the journal is mine. 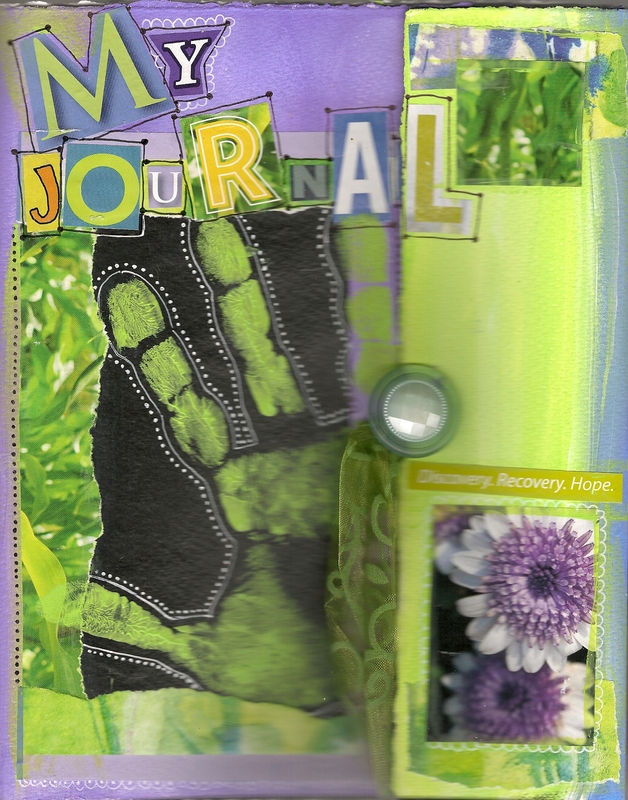 Each participant who takes the class will of course place their own hand print on their journal. Remember…I said I was going to help you tap into your inner finger painter…and I am! Here are the pics – With the tie open With the tie closed I will eventually make an online version of this workshop. Stay tuned! Have a fantabulous Friday! OK…Let’s talk Teesha! Teesha Moore is a force to be reckoned within the art journalling community. She is fantastically amazing and inspires me to create art whenever I see her work online. You see…Just now when I was going to her site to capture the link I lost myself in her art for at least a half and hour. Go visit her too, but make sure you have some time. You will be there for a while. It is EYE CANDY! She has a vividly creative mind and an inspiring spirit when you read all about her in her bio. That reminds me…I have to finish my own Bio so you can get to know me too. As I have mentioned in previous posts, I am involved in a journal pass on www.willowing.ning.com. Many of my posts to come will showcase work I am doing within the members journals. You may get tired of me talking about this, but it is just so exciting I can’t seem to stop! One of the journals I just finished “arting” in and passed on was from Cary, another member of our group. 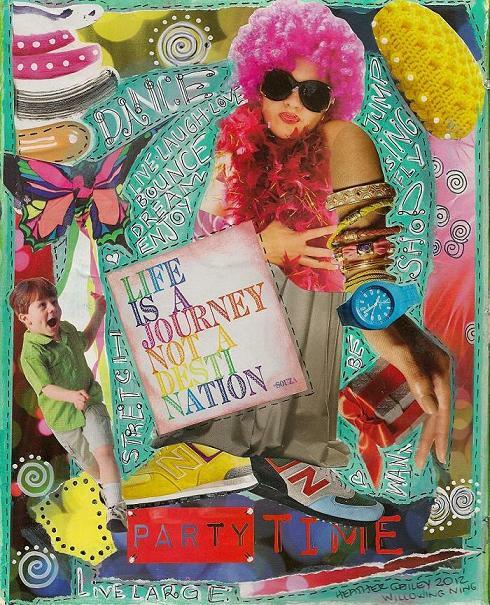 She chose her journal theme ahead of time and let us know via online group posts and instructions inside the journal that our entry was to be “In the style of Teesha”. Everyone had to make their journal entry look like Teesha had done it…well…no, not really. It was to be a piece of art that was inspired by her creative musings, using her painting and journalling techniques, and doing all of that with playful abandon. All the journal entries that went ahead of mine were fantastic and were so much fun. Most of the members used a quote as their inspiration. I do have pictures, but I am not able to show them to you because I have not received permission from the artists, but you can trust me on this one. I love recycling and cutting up magazines, so this was a perfect style for me. The background was already painted. If I remember correctly, Cary painted all her pages. It was not one of the requirements as some members did and some didn’t. The turquoise probably was not a colour that would have been my first choice, but you have to remember this was a challenge. Thinking outside of the box is required for this project so I chose to go with it. I started to look through all of my magazines and found brightly coloured articles, pictures and words, and I was off to the races! as you can see I outlined most of the elements in what looks like stitching. Love! Love! Love! using a broken line. I glued the magazine pieces down with a really good glue stick. I only use UHU. I find it to be the best “stickum” around. I also use GOLDEN matte medium in some cases. I used my Sharpie…go figure! I also used a white poster paint Sharpie with a large tip…which is funnily NOT my best friend. I didn’t find that it had good coverage at all. I ended up going over the lettering many times to get it to be opaque. You will see what I mean if you look closely at the picture. I will have to look for another alternative next time I go to Michaels. All in all it was a fun exercise. As and artist who already has a distinctive style, I find it fun and refreshing to break out of the mould and try my hand at the stylings of other artists. It is a great trick for both professionals and beginners. For beginners it actually helps you to find your own style, merging everything you’ve learned into one big ball of wax of your own. Can’t wait for the next Journal to arrive! I will keep you all posted.